Lessons Inherited - Lessons Inherited is a refreshingly candid and transparent look at seven decades of lessons learned through life's hills and valleys. From her mother's physical challenges, the family's many moves across the country and other personal challenges, Jeanette draws many spiritual lessons learned from these circumstances which she wishes to pass on to all of us. Experience first hand how Jeanette's life and her mother's life parallel in so many ways and rejoice in how Christ has remained the center of it all! 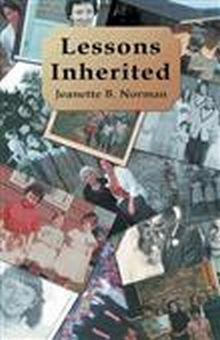 Lessons Inherited is a refreshingly candid and transparent look at seven decades of lessons learned through life's hills and valleys. From her mother's physical challenges, the family's many moves across the country and other personal challenges, Jeanette draws many spiritual lessons learned from these circumstances which she wishes to pass on to all of us. Experience first hand how Jeanette's life and her mother's life parallel in so many ways and rejoice in how Christ has remained the center of it all! Want it signed for a friend, family member or co-worker? Let me know when you place your order and I would love to do that for you!